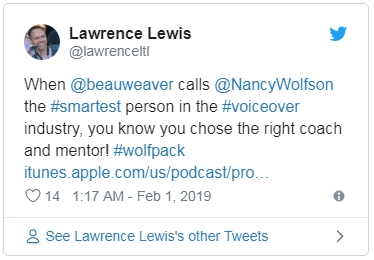 Nancy Wolfson has schlepped from hell to breakfast hosting amazingly well-received Group Intro Lectures & Classes to curious VO folk all over the US, Europe, Canada, Nashville, Las Vegas, Seattle, and New York City. Braintracks Lectures and/or Braintracks Group Classes (if available in your area) are great ways to share the expense of getting hours and hours of broad introductory information about what this business involves and the very basics about performance. They are jam-packed with current tips you need to know about the industry, and they’re certainly lots of fun. For the rest of you who want more than a lecture, if you are 100% SERIOUS about seeing if VO is right for you and you WANT TO GET STARTED ALREADY with “on-microphone” training that is TAILORED to your abilities, skills, needs, and style, and if you want to turbo charge your drive towards a customized, branded demo, agency representation, castings, and money-making opportunities now, if you don’t live in L.A., Nancy coaches via PHONE sessions to folks calling in from any and every hamlet on the globe. To apply for private coaching now, click: PRIVATE NON LOS ANGELES PHONER LESSON WITH NANCY. or would like to be notified if/when a Group Overview is scheduled for your area, CONTACT US HERE now with a request, indicating where you live and any other relevant info/requests. I learned more in that one workshop than I have in the 14+ years I’ve been doing voice-overs. I learned what it’s going to take to be the V.O. talent I imagine myself to be, and that’s huge. Nancy was exactly what I needed. I wish I had met her years ago. Nancy, I’d like to take a session with you as well. You are so good at finding the action in the copy. The booth director goes nuts after I do your direction. I would like to know what you look for. I know it is second nature for you now.